One of the beach carts that you can consider buying today is the Seina Collapsible folding wagon. It is a wagon that is available in fantastic colors. Just like other beach cart Seina is made of high-quality materials and has impressive features that beach lovers would surely enjoy. The price is reasonable, so you don’t have to worry about it. You will appreciate the sturdy black powder coated steel frame that holds the durable polyester fabric. The polyester is a favorite material that is known to be very sturdy and will last longer than expected. 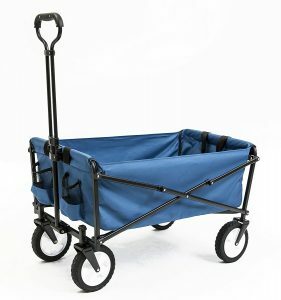 This collapsible wagon does not require complicated assembly, all you need is to unfold it, and you are ready to go. If not in use, you can just fold it and store. It has an 8 inches heavy duty rubber wheels that offer easiness for you to transport your drinks, accessories and other beach stuff. 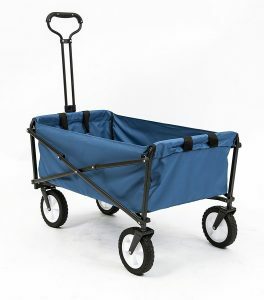 You can also use the wagon in carrying the heavy sports stuff, gardening materials and all the things that you need with a maximum weight of 100 lbs. The total dimensions are 34 x 21 x 46 when open and 29.5 x 19.67 x 6.89 if open. It is lightweight and compact, but it performs at its best. The wagon collapses quickly for secure storage, and it will not take up much space in the car. It is lightweight and moves with ease. It is durable since it is made of high-quality fabric. You can lock the handle in place in a vertical position. As compared to other folding wagons it is much smaller and has a low weight capacity. When folded it does not stand on its own. The Seina Collapsible Folding Wagon is an essential gear that can help you carry your beach accessories from the vehicle to the beach. No assembly required, if you need to use this product, you can just unfold it and then go. The wagon is necessary to make the carrying experience easy because it can use to transport different materials to various destinations. It is designed using high-quality polyester fabric that makes it simple for you to carry all your things. To improve its performance, the wagon is designed with a sturdy black powder coated steel frame for convenient function.